The only problem is you don’t have a business. You read post after post online about how companies grow to multimillion dollar stardom. Their founders smile at you from the cover of magazines telling you things like “focus on building a great team” and “never stop testing”. You stare back wondering how to even begin. You’re living in an entrepreneurial purgatory. That no man's land between having a business and having an idea for a business. If you're one of those entrepreneurs, then I have good news for you. This post is all about that first step, getting that proof of concept, and pushing forward into a full time career as an entrepreneur. Using the case study from social media powerhouse Buffer - a company that built a 60 million dollar business after validating their idea using a set of landing pages - we’ll help you replicate the process, generate a proof of concept and answer the age old question: if you build it, will they come? It’s one thing to have an idea for a business, it’s another to have a laser-focused understanding of exactly what you're offering. The latter is required before launching a business. One strategy to do this is to think of your idea as an elevator pitch. Imagine you have 20 seconds to describe your business to an influential investor, or else walk away with no dough. Run through this exercise a couple of times and try and remove any jargon that might cause confusion. As a litmus test of understandability, ask yourself “if I explained this to my mother would she understand?” (assuming your mother isn’t an expert in your field). If the answer is yes, you can start thinking about how you’ll position your offer. Once you’ve clarified your idea, it’s time to create your minimum viable product. To start, you’ll need to create a couple landing pages and install google analytics (or use the analytics tool built into your landing page builder) to monitor traffic and button clicks. On the first landing page describe your product as if it’s already available by listing the basic details of how it works, some of the features you’ll be offering, and provide a call to action leading to a product or pricing page. Use the simplified description of your idea that you created in step one as a starting point for your headline and your general description. Take a look at Buffer’s page below. 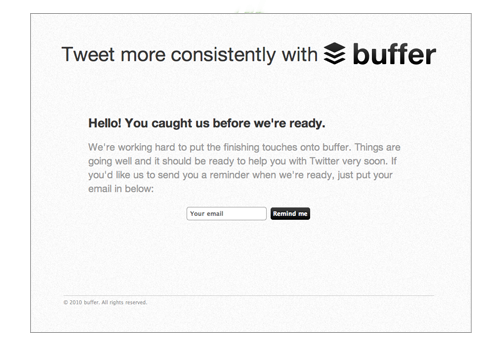 They took their main benefit - “allow people to schedule Tweets in advance” - and condensed it into a headline that said “Tweet more consistently with buffer.” They then explain how their product works in bullet points leading to their plans and pricing page. 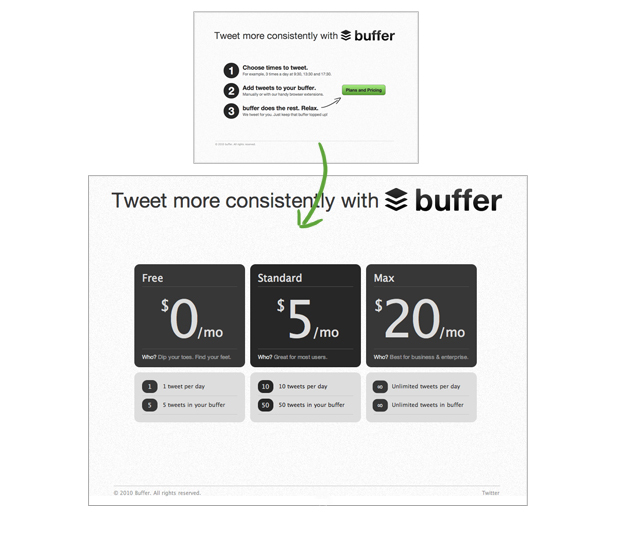 This page gives specific details about what a user is going to be buying, in Buffer's case different packages of their social media scheduling software. 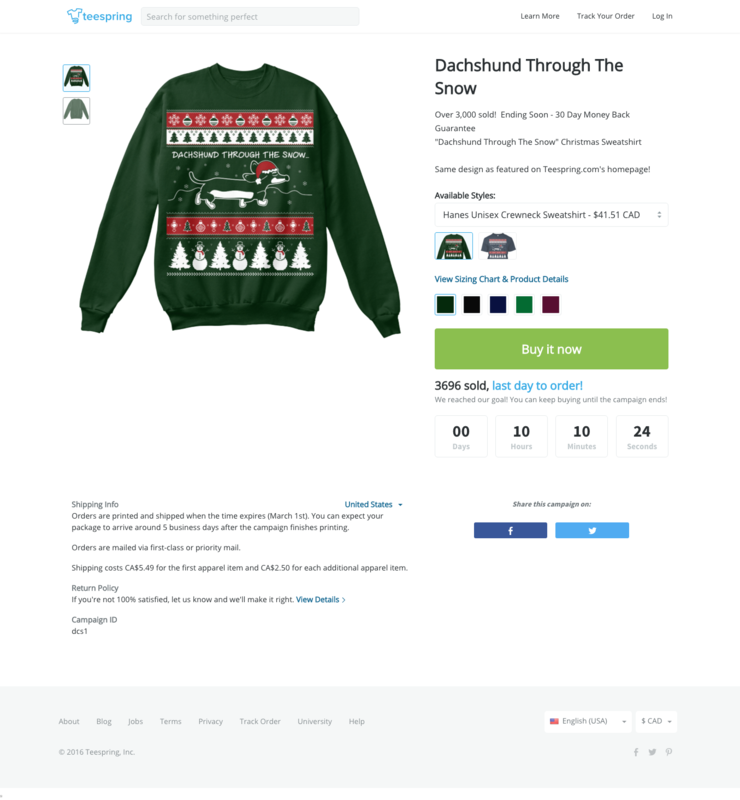 If you have a physical product, this page could include physical specifications of the product, some different colors that might be available, and possibly even shipping details. This is essentially a pre-launch page with a short message explaining that the product is not quite ready. It gives users the opportunity to enter their email to find out more about the product once it’s ready to go. Using these three pages you can essentially test out your entire sales funnel without ever creating your product and start to address any user objections prior to any upfront investment. It will give you the chance to gauge user interest as they move through the different stages of your website eventually resulting in a purchase decision. I’d recommend using a landing page builder to create these pages since they often come with things like A/B testing, analytics, and working forms. Obviously feel free to use any other tool that you like, or alternatively to code it up yourself using HTML, CSS, and maybe a little PHP. Once your three pages are up it’s time to flood them with traffic to see if people actually want to buy. Luckily up until this point you’ve spent zero dollars, so you can afford to spend a little budget on paid ads. The two main avenues you can use are either Facebook Ads or Google AdWords. I’d recommend using AdWords since you’ll be able to target users with an intent to buy rather than targeting based on demographics alone. What’s best will vary depending on the type of product or service you’re offering and whether people are actively searching for your product. If you decide to go the AdWords route, focus on long tail keywords (keywords over 3-4 words) since they’ll help narrow in on users with higher purchase intent rather than users searching for generic information. 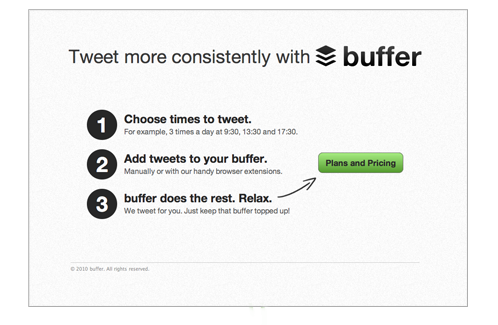 In Buffer’s case, they could have bid on the keywords “social media scheduling” rather than “social media”. If you go the Facebook route, try targeting fans of similar products if the product exists, if not then narrow your demographic details using the “narrow audience” function until you have an audience around 200,000. Whatever traffic source you decide to use, remember to leave your campaigns running long enough to get the data required to prove your concept. That could be up to a couple weeks depending on the size of the audience you're targeting. If no one is buying then you’ll need to work on refining your landing page copy, re-evaluating your traffic sources, or even starting to reconsider your product. By following these steps to simplify your idea, create a sales funnel, and drive traffic to your page, you’ll be able to determine whether people are actually willing to buy your product. Data doesn’t lie, so if your conversion rates are low (or nonexistent), then you’ll probably need to consider re-positioning your product or pivoting some aspect of your business. If your conversion rates are good then congratulations! You’ve tested your hypothesis, validated the market and now have your first proof of concept. Have you ever validated an idea with a landing page? I’d love to hear about your experiences in the comments below.